Heat a large saute pan under medium high heat. Add olive oil and saute mushrooms until they start to soften, about 6-7 minutes. Season with salt and pepper, to taste. Heat a medium saucepan under medium heat and melt butter. Whisk in flour to create a roux. We're basically just making a fish/seafood gravy. Cook roux for about 1-2 minutes, or until slightly a pale yellow color. Slowly incorporate the stock, whisking constantly to avoid lumps. Then whisk in wine, followed by the milk. Bring mixture to a boil and cook until slightly thickened, to sauce consistently. You can thin it out with extra stock, if you need to. Stir in the shiitake mushrooms and season to taste. Keep warm until ready to use. Season the sea bass with salt and pepper and dredge in the flour, shaking off any excess. Heat some vegetable oil and/or butter in an oven-proof saute pan under medium high heat. Place the sea bass, skin-side down, in the pan and cook until skin is crisp, about 3-4 minutes. Flip over and carefully transfer pan to the oven to finish cooking the fish, about 5-6 minutes. While the bass is in the oven, you can quickly cook your peas. Bring the water to a slow boil in a small saucepan. Add peas and cook until warmed - they're frozen peas, so they're already cooked. Drain and set aside. When everything is ready, you can assemble your plate. Place about 1/4 cup of the shiitake veloute in the center of each plate. Top with a mound of peas. 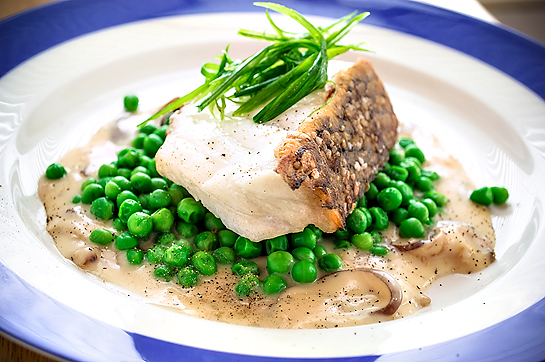 Top the peas with the sea bass. Garnish with whatever you like - I used some chives.